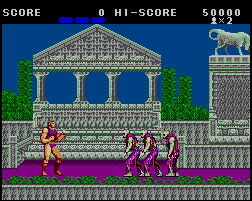 Altered Beast is a side-scrolling beat-em-up that was first released in the Arcades in 1988. Awakened from the dead, you've been summoned by Zeus to free his daughter and destroy the evil Neff. There's four stages (one less than the Mega Drive version) that automatically scroll from left-to-right and your basic attacks are a punch, kick, and an upwards kick. However, by defeating blue wolves and collecting their Spirit Balls you'll transform into an animal with completely new abilities. These include a Wolf (fireball, flame), a Dragon (lightning bolt, lasers), Tiger (bouncing flame, fire) and a Gold Wolf (fire and arrows). Unfortunately the Bear is absent from this port and you only have to collect two Spirit Balls (instead of three) to transform into an animal. The action is slow and choppy with tons of flicker on display; enemies frequently spawn directly on top of your character sprite so you'll take lots of cheap, unavoidable hits. There's no grace period when you're knocked down either so enemies gang up on you and pummel away before you can react. The only real bright side of the entire gameplay is that once you've powered-up into an animal it's mildly amusing being able to take out enemies from long range as it evens the playing field. The bosses are dreadful with unresponsive controls and a shockingly low frame-rate that completely ruins the battles; making precise movements is impossible and many times that you press a button it's either severely delayed or ignored entirely. Although the sprites are large, the animation and SFX are pathetic, especially when you destroy an enemy as they shatter like a piece of pottery! At least the few voice samples are impressive for the system. With Altered Beast on the Master System it's clear that the developers were punching way above the consoles' weight. The action is far too choppy and coupled with the already shoddy gameplay and stiff combat mechanics it's a game that can only be recommended to die-hard fans of the series. Random trivia: Another 8-bit version of Altered Beast was released on the Nintendo Famicom in 1990.